While I love a sweet treat, these days I’m baking more in an attempt to warm up the house than I am in order to have dessert for later on. I know the polar vortex has many of us experiencing single and below-zero temperatures, but as I told my dear mother just recently, “-3°F and -37°F are two different animals, at two different zoos, on two different continents!” Just yesterday, my eyelashes froze together. Like, to the point where I actually couldn’t fully open my right eye. What life is this?? The kitchen has been getting some extra steady use lately then in an attempt to feed, warm, and occasionally defrost, us simultaneously. 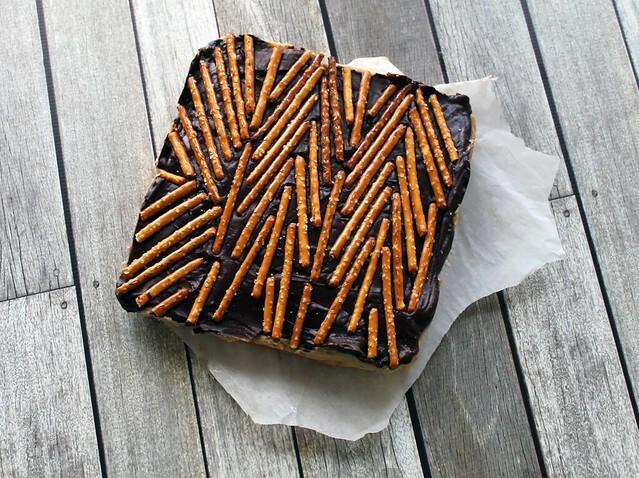 Most recently, I made these totally decadent peanut butter & pretzel cake bars, which were the result of a literal dream I had after perusing Pinterest too close to bedtime. In a dormant state, my brain mixed the memory of a recipe I had seen pinned from Better Homes & Garden with the recent, whimsy food trend to add pretzels to all sweet things. A self-identified sweet-and-salty-aholic, I wholeheartedly support this move – even in my subconscious. So that’s how we got here, to Peanut Butter & Pretzel Cake Bars, which doesn’t sound like a terrible place to be, does it? The layers here are what’s important and I think you’ll find them pretty agreeable too. While the BH&G recipe has the base as a chocolate cake, I went with vanilla out of personal preference and layered on top of it this peanut butter cream that is both smooth and airy, almost whipped. 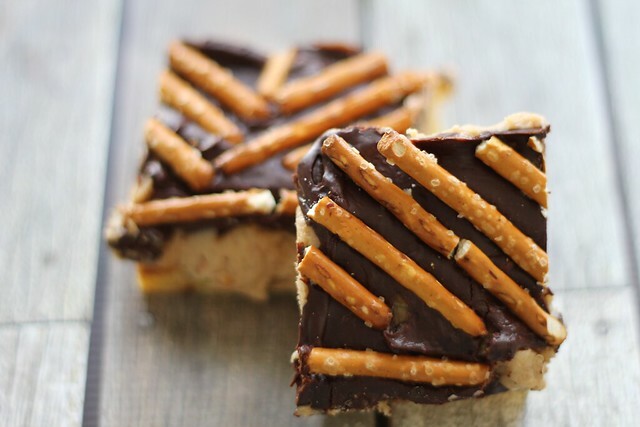 Above the peanut butter is a thick, glossy blanket of chocolate ganache topped with the crunch and salt of your favorite pretzels. They’re a perfect little treat for potlucks, lunch boxes, and birthday parties alike. And, honestly, I think you can actually make these look awfully pretty with a little skill in terms of pretzel placement and design – a dirty job that somebody has to do. I was attempting a chevron pattern here, but that went off the rails quickly and yet, I still think whatever this turned into is rather nice to look at. You know, before it got cut into squares and devoured! I can also imagine these looking awfully sweet punched out with a heart-shaped cookie cutter for Valentine’s Day, a sprinkle of crushed pretzels then dusted across the top. Or heart-shaped with white chocolate ganache and red & pink nonpareils! Adorable. Deliciously so, and sure to help snag a valentine or two. Yields 9-12 bars; Adapted from here. Note: The original recipe calls for making this in a 15″x10″ pan. I wanted to halve the amount, but also have a thicker, denser base, so I adjusted this to accommodate an 8″x8″ square pan, but used the original amount of cake base . Do what makes sense for you and yours. Preheat your oven to 350°F. Line an 8″x8″ pan with parchment paper and set aside. In a bowl, combine the cake mix and melted butter and stir until combined. Beat egg in a separate bowl, add to cake batter mixture and incorporate. Pour mixture into the cake pan and bake for 20 minutes or until golden brown along edges. Allow to cool completely. In the meantime, use a hand-mixer or stand mixer to blend the peanut butter, 2 Tablespoons of whipping cream and then add the powdered sugar. If mixture is very thick or dry, thin out with the additional tablespoon of whipping cream or milk. Whip until thoroughly combined and a bit fluffy. Pour over cooled cake base and spread out with an angled cake spatula. 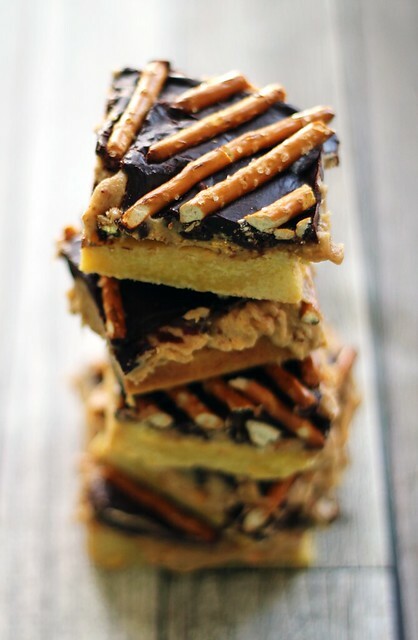 Place pan in the refrigerator for at least one hour or until peanut butter layer has firmed up a bit. When it has done so, but before removing from the refrigerator, microwave the chocolate chips and 2 Tablespoons of whipping cream for 30 seconds and stir. If the chips are not yet soft enough to stir until smooth, repeat microwaving at 15 second intervals until melted. Remove pan from refrigerator and pour ganache over top, spreading to cover the surface. Be gentle here, so as not to pull the peanut butter up into the ganache. 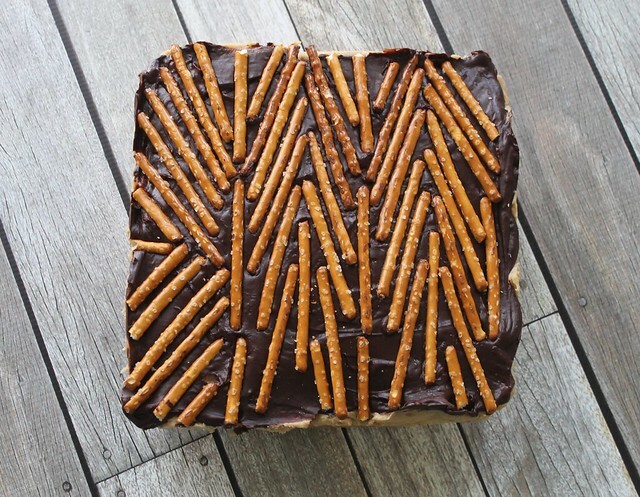 Top with pretzels in the design or scattering of your choice and return to refrigerator for at least 1 additional hour. Slice into bars when firm, but allow the chill to dissipate before eating, about 15 minutes.